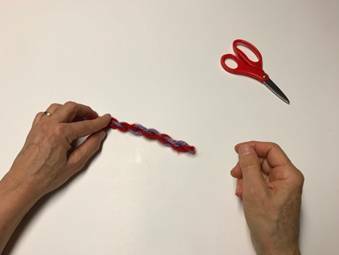 FUN WITH FIBER! 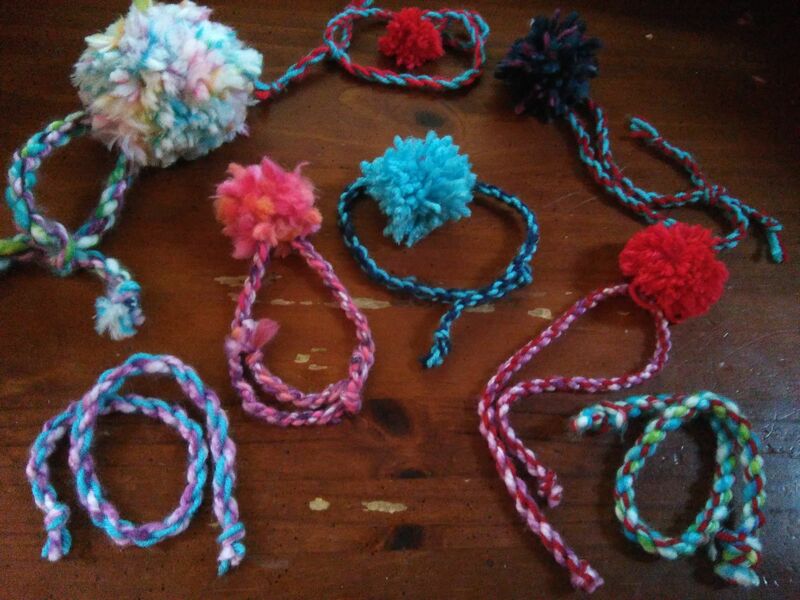 TWISTY CORDS, POM POMS, & TASSELS! 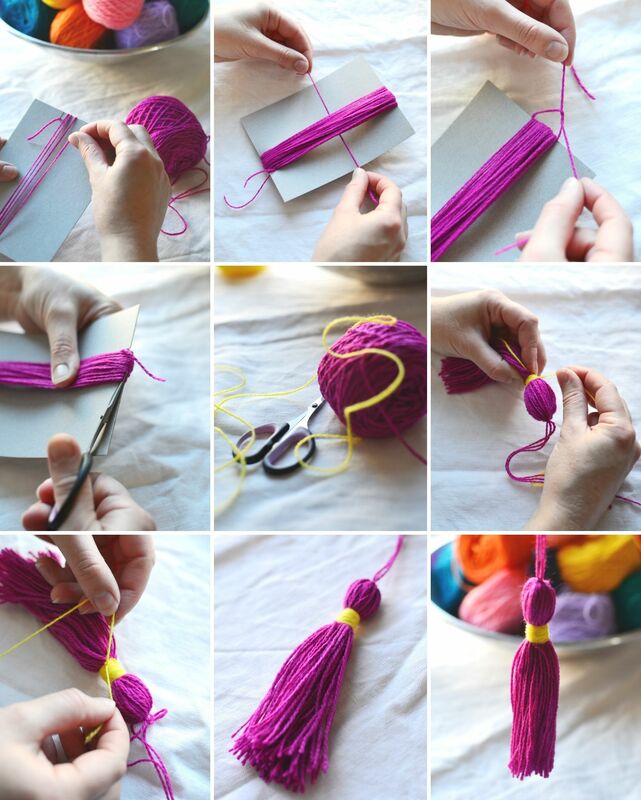 TEACHERS: Have your students make 2 yarn balls, each a different color and each using 25 yards of yarn. 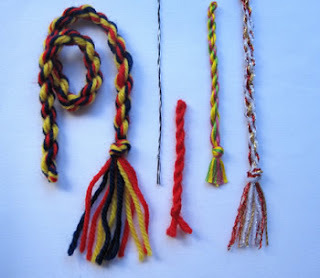 Next, make the 2 kinds of Twisty Cords shown directly below, then make your Pom Poms and Tassels. But most of all....BE IMAGINATIVE & HAVE FUN! 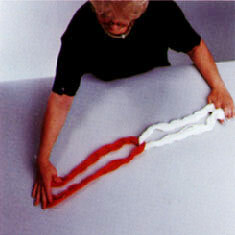 General directions: Take one or more pieces of yarn, equal lengths, fold in half, knot together at one end, step on knot end with foot (or use a friend, doorknob, etc), twist tightly (holding onto the far ends), keeping yarn taut (i.e., extended, stiff, etc), put finger in the middle of cord, fold over, grab other end, keeping the cord taut, then let go of the one end shaking your arm up and down violently, smooth out the cord by running your hand down the cord, knot off at both ends & cut ends to make a tiny tassel of sorts. 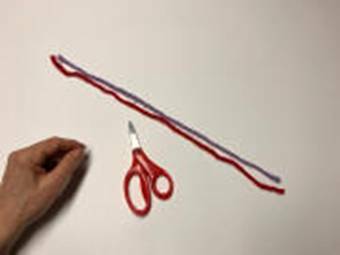 TWISTY CORDS: HODGEPODGE & CANDY CANE STYLES! Step 2. 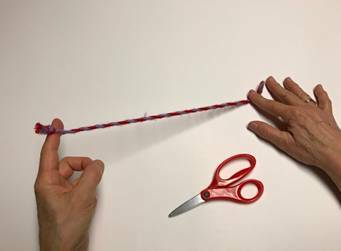 Tie a knot on each end. Step 3. Hold down on end and twist the other end. Step 4. Hold taut on both ends & fold in the middle. 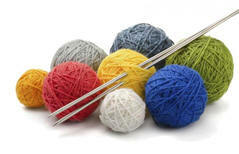 For bigger projects, use a partner, foot, or door knob to keep yarn taut. Step 5. 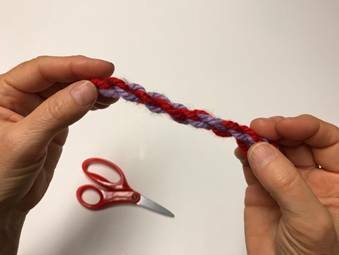 Bring ends together & prepare to release yarn on the opposite/folded side. 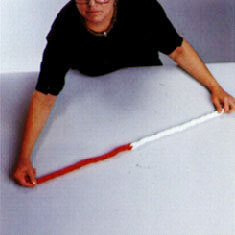 You can also "whip it" for better results and lots more fun! Step 6. 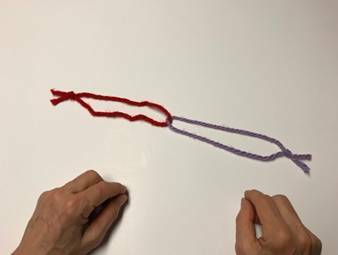 Yarn will automatically twist! Like magic! Simply rub out any kinks. 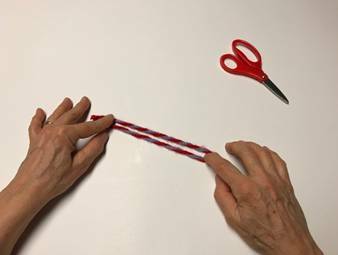 And now you have a "Candy Cane" Twisty Cord! 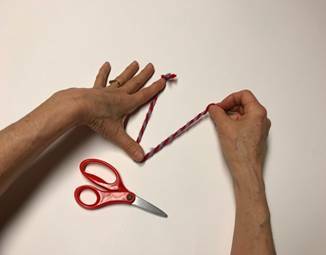 General directions: Wrap yarn around your hand (fingers, fork, etc) several times, take off, tie tightly in the middle with a strand of yarn, cut loops -not 2 long strands used to wrap pompom, and trim as necessary, affix to Twisty Cord (see below), shoes, bags, dogs, cats, mice, etc. 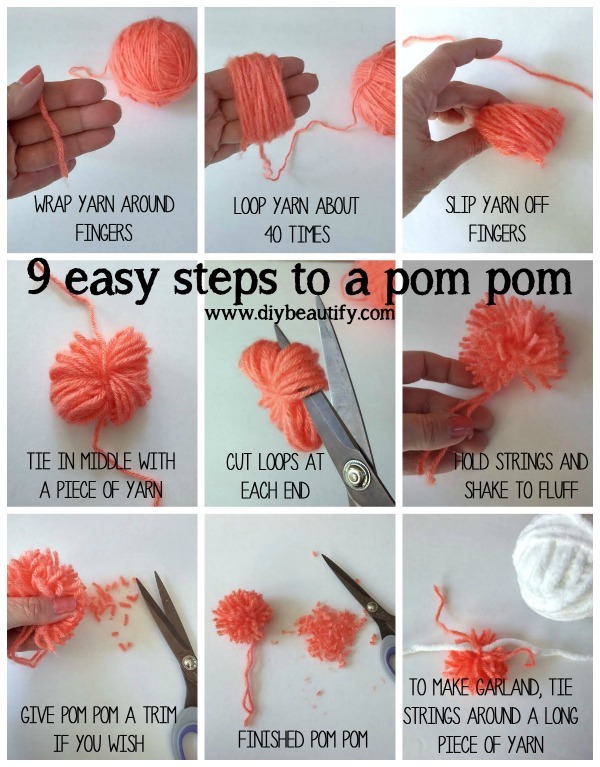 wrap yarn twice around middle of pompom, before tying first knot. 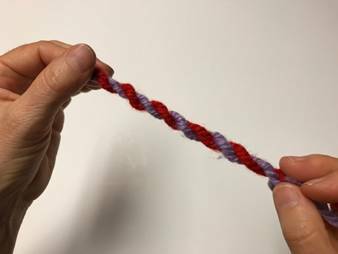 3-wrap-knot: when tying your first knot, wrap the left yarn three times around right yarn before pulling tight. 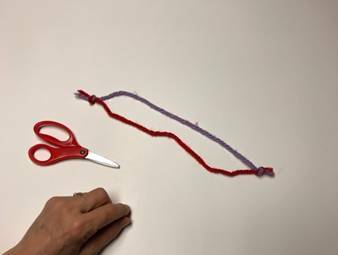 for your last knot, tie yarn "left over right, then "right over left" - that's a square knot and will not pull out.